After an extremely mild (and very welcome) winter, spring is officially here. One of the "early birds" that gets planted is peas. Peas are grown vertically. We've tried lots of different types of trellises, and we haven't been pleased with any of them. It's always such a hassle trying to untangle the old pea vines from the strings or netting or whatever, that we usually just end up throwing it all away. I hate throwing things away that should be able to be used again. Rich came up with this idea for a trellis, and he and I spent a day building and installing it. The uprights are 3/4" galvanized electrical conduit, with 3/8" holes drilled in them. The top cross-braces are 1/2" galvanized electrical conduit, with the ends bent with a conduit bender. 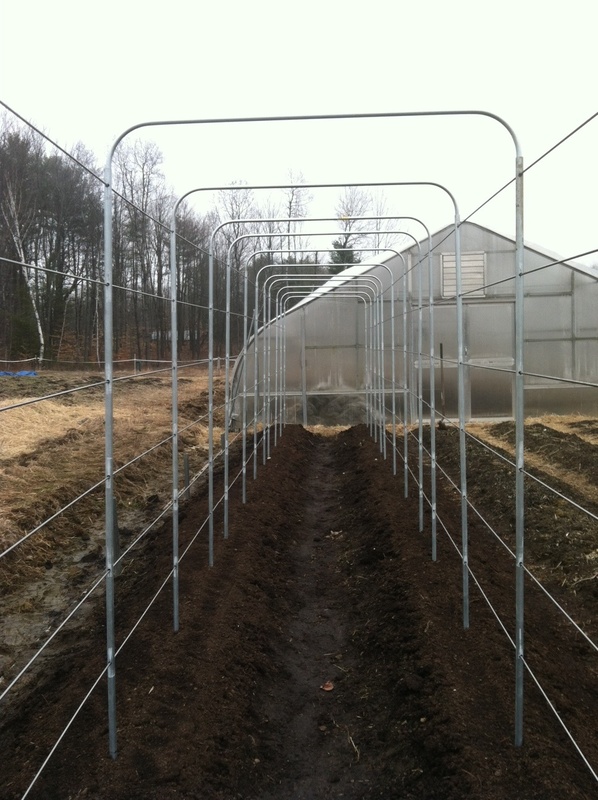 The horizontal rungs are 1/4" stainless steel rods, 12' long. It went into the ground much easier than we expected. Our hope is that after the peas are done, we can just pull on the rods to slide them out of the holes in the uprights. The cross-braces are just set in place, so they'll lift right out. Then pull the poles out of the ground, and the whole thing is ready to put away until needed again. If it works as planned, it should outlast us. Besides pea seeds being in the ground, so are our tomato seedlings, about a week-and-a-half ahead of schedule. We've grown a mix of varieties every year, trying to come up with ones we and our customers like best, keeping some from year to year, and trying other new ones. This year we're growing three yellows and three reds. We had grown Sungold several years in a row. Almost everybody loves the little yellow cherry tomatoes that are so super-sweet, almost more like dessert than a salad topping. Last year, on the recommendation of a friend, we tried Sun Sugar instead. Its fruit looks identical to Sungold, but it doesn't have as much of a tendency to split. We're growing it again. Last year when we ordered seeds, we received a free trial packet with Amish Gold, a yellow slicer. We liked it so much, we're growing it again. Out third yellow came in a trial packet this year. It's a yellow beefsteak named Giallo De Summer. We get almost all of our garden seeds from Johnny's and Fedco, but the past couple years we've ordered tomato seeds from Totally Tomatoes and been very pleased. For reds, we're growing Amish Paste for the third year in a row. It's a large Roma, that can double as a slicer. Also, this year we've added Red Brandywine. Last year we grew Pink Brandywine and Black Brandywine. The Brandywine family are great heirloom tomatoes. Finally, we're growing a variety that we haven't grown since we lived in California---Early Girl. We always had good luck with it out there, so we thought we'd give it a try again. Spring peas and summer tomatoes on the way!